Musician Nikki Sixx has sent a letter on PETA's behalf urging Texas A&M University (TAMU) to stop breeding golden retrievers and other dogs to have painful and debilitating canine muscular dystrophy and to end its use of dogs in cruel experiments. In the letter, Sixx points out that because 37 years of these misguided tests — for which dogs are caged, often alone, in barren metal cells — have failed to produce a cure or even a treatment for the disease in humans, TAMU should admit defeat and redirect its resources into modern, humane, animal-free research methods that could actually generate results. "A cure for muscular dystrophy must be found, but subjecting dogs to pain and misery is not the way," writes Sixx. "Please end this cruel practice, stop breeding dogs, and allow the ones who are currently suffering in your laboratories to be adopted by families who will give them lives filled with love and care for the time they have remaining." The MÖTLEY CRÜE star has two golden retrievers himself and hates to imagine if they were being treated this way. He tells PETA: "I have enjoyed going to Texas throughout my whole touring career. Getting to experience the culture, the food, and the people there over the last few decades has been incredible. My wife and I are the owners of two incredibly lovable golden retrievers. So to say the experiments at Texas A&M University are absolutely heartbreaking is beyond an understatement." Sixx's letter to TAMU president Michael K. Young follows. "I'm writing to you today after PETA shared with me the disturbing video documenting that golden retrievers and other dogs with canine muscular dystrophy are caged in barren metal cells — often alone — in Texas A&M University's (TAMU) muscular dystrophy laboratory. "Despite 37 years of experiments on generations of dogs, these tests have not yielded a cure or even an effective treatment to reverse symptoms of the disease. This is no life for 'man's best friend.' These experiments need to end, and the dogs need to be released for adoption so that they can finally lead the lives that they deserve. A cure for muscular dystrophy must be found, but subjecting dogs to pain and misery is not the way. Given that these experiments have never produced beneficial results, TAMU's resources are better applied elsewhere — and in a more compassionate direction. "Please end this cruel practice, stop breeding dogs, and allow the ones who are currently suffering in your laboratories to be adopted by families who will give them lives filled with love and care for the time they have remaining. Thank you for your time and attention to this important matter. 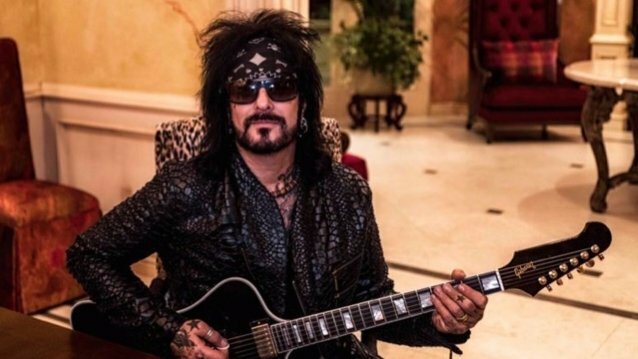 In a letter to Rolling Stone, Texas A&M disputed PETA and Sixx's claim that the dogs were harmed in the video. "Animal activists have repeatedly used a video of a golden retriever cross named Jelly, shown with food on her face," Texas A&M wrote. "The activists suggest the dog was being fed 'gruel.' … Their food is of the highest nutritional value and once she'd finish, caregivers always cleaned her up. We all were so sad to see her exploited in the video because that wasn't her life: It was a moment in time. Jelly easily was one of the happiest dogs here. "Another dog, Poeney, is shown drooling (and wagging its tail) in slow-motion footage distributed by animal activists," the university adds. "However, they never explain that the dog is shown coming out of anesthesia after awaking from a cardiac MRI. Her drowsy, uncharacteristic behavior is common for an animal — or human — in recovery after a procedure." Read Texas A&M's full response at this location.